The Candia Community Woman's Club . . . Volunteering since 1983. 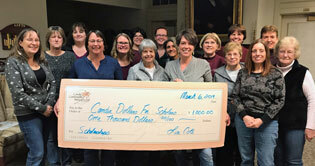 The Candia Community Woman’s Club currently has twenty women that strive to give back to the community by creating fun family events, participating in town projects and reaching out to organizations that are in need locally, nationally and internationally. We love seeing the community come together. CCWC plans many family events and gatherings throughout the year that strengthen the sense of community in our town. In past years, events include our Christmas Tree lighting ceremony, community skating at the town pond, Loaf & Ladle, Chocolate Extravaganza, and Touch A Truck. We are always planning a great event to attend with the family. The CCWC takes pride in their town by supporting local projects. We help keep Candia beautiful by collecting litter along Rte 43 from the post office to exit 3. Members also organize and run the Food Pantry every week at the Town Hall. Each year we look forward to organizing the Candia Town Wide Yard Sale. There is nothing better than lending a hand to those in need. CCWC finds gratification in organizing projects that benefit others such as Stitching Up The World which provides handmade items to cancer centers and homeless shelters. We bake homemade breads that are included in the community baskets that are given out at Thanksgiving and Christmas. Each year we fundraise more than $7,000. This money is given back to the Candia community through scholarships, fuel assistance, teacher appreciation, programs at Moore School, and other projects that we sponsor. With so many wonderful projects and events the CCWC organizes you are sure to find an interest with our group! Interested in joining the CCWC?